Veterinarians see pet rats most frequently for two main reasons. The first is for tumors (usually mammary) and the second is breathing problems. Both can be quite serious, but breathing issues are usually more acute and require a quick approach to treatment. 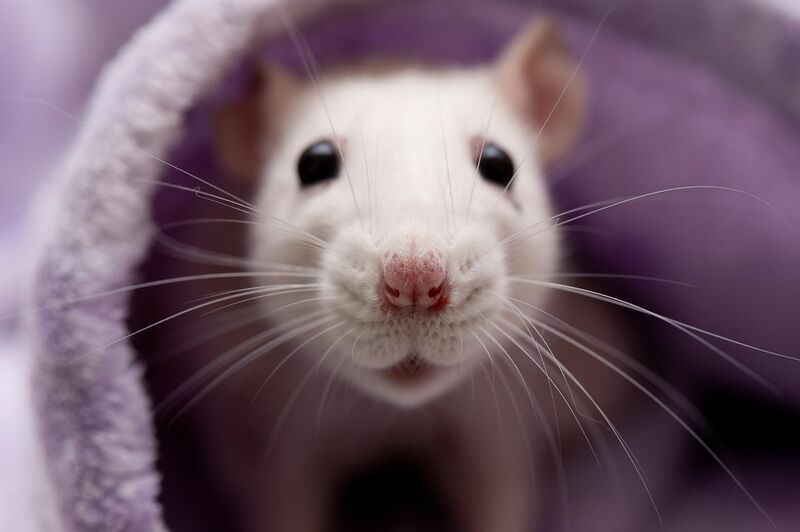 Rats' respiratory systems are delicate and easily irritated, so keeping a clean enclosure is especially important. This may seem contrary to the image most people have of rats in the wild, but for domesticated rats, cleanliness is critical. Why Do Pet Rats Have Breathing Problems? Several factors can contribute to breathing problems in rats. The type and condition of its bedding, an unclean environment, and diseases can all cause respiratory distress in your pet rat. There are also bacteria, viral infections, colds, and other health problems that can cause breathing issues in pet rats. Mycoplasma is a bacteria that almost all pet rats normally have. When a pet rat's immune system is weakened, either due to stress or from another disease, these bacteria cause an upper respiratory disease called mycoplasmosis in rats that when left untreated may morph into pneumonia. Streptococcus, Bordetella (the same bacteria that give your dog a cough), Pasteurella, and other types of bacteria can also play a role in the severity of disease, but Mycoplasma is typically the primary reason for illness. There are some viral infections that are more common with pet rats, including Lymphocytic choriomeningitis (LCM) and Seoul virus. LCM is a rare viral disease. It's transmitted through the urine, feces, saliva, or other cage materials of rats (and other rodents). Seoul virus does not make rats sick but can be very dangerous for humans. It's a type of hantavirus and is carried by Norway rats. If a human is infected with Seoul virus, they can range from no symptoms to serious illness that can require a hospital stay. Rats can be tested for Seoul virus. Talk to your vet about this test, which can be beneficial before you bring your rat home. While these bacteria appear in rats with Mycoplasmosis and pneumonia, Streptococcus more often afflicts young rats. Under the microscope, it appears as gram-positive diplococci (two tiny purple circles) and is treated with antibiotics. If your rat seems lethargic, has excessive porphyrin tearing (from stress), isn't eating as much, or has any discharge from its nose, it should be brought to the vet as soon as possible. The animal will not just get better on its own and waiting to see if it does usually make things worse and harder to treat. Bedding that's dusty, dirty, or consists of cedar shavings is the main culprit for respiratory disease when the cage substrate is to blame. Don't use cedar shavings as substrate, and make sure the bedding stays clean and free of dust. As with humans, too much dust in a rat's environment can cause respiratory problems, as will dirty bedding where mold might start to grow. Cedar bedding has long been known to irritate the respiratory tract and even cause liver damage. Rats can also get colds from being too close to an air conditioning vent, window, or door. Other causes for respiratory infections besides bacteria include airborne bacteria, or, a mother rat passing on an infection to its pups. A rat that mates with an infected rat also may contract a respiratory infection. Rats often get tumors, especially along their mammary chains, which are roughly the rodent equivalent of mammary glands. Both male and female rats are susceptible to breast tumors and these tumors can spread throughout the body, including the lungs, causing breathing problems. A radiograph (x-ray) or CT scan are the best ways to tell if your rat has tumors in its lungs. If your rat is having problems breathing, whether or not there is nasal or ocular discharge, seek help from your exotics vet and start treatment as soon as possible. If your rat is diagnosed with a more serious condition, the treatment will vary based on the problem. There is no cure for mycoplasmosis at this time; treating the symptoms of the disease is all you can do to keep your rat comfortable and slow the progression of the disease. Antibiotics and other medications will be prescribed by your vet based on the severity of the disease. New treatment techniques are slowly surfacing so your vet may choose to try something new with your permission, or perhaps one day a vaccine or cure will be found. Until then, rats can still live for several months after being diagnosed with Mycoplasmosis and maintain a decent quality of life while on chronic medications. Since a rat that is infected with a viral infection can transmit the infection to other rats and people, the Center for Disease Control (CDC) recommends euthanasia of infected rats. Treatment should be started immediately since the infection can quickly progress into pneumonia. Rats often die from Streptococcus infections, but you have a chance to save your rat if you start antibiotics before your pet rat contracts pneumonia. A clean environment is a key to a healthy rat. Try using shredded newspaper in the cage instead of shavings. It is an economical option and can be removed and replaced easily. A vet will come up with the best course of treatment. Sometimes a cold will pass, but keep a watchful eye. Upper respiratory tract infections often turn into lower respiratory tract infections and should be taken very seriously. These types of breathing problems may not be due to bacteria like Streptococcus or Mycoplasma but they should still be addressed as soon as possible. Your vet will identify the type of tumor and make a treatment recommendation. Some may require surgical removal. Other tumors can be treated with medication. Some types may be untreatable. The best way to prevent most respiratory problems in rats is to keep their enclosures clean. Don't allow your pet rat to be around other rats if you're not sure what diseases they may carry. Rats transmit diseases to each other easily. It is also important to note that many of these diseases are very contagious. It can be passed to other pet rats very easily. So if you have other rats in your household, quarantine your infected rat from the others and thoroughly wash your hands after handling it.